This week's rain is not expected to break California's drought, and will continue to capture news headlines. 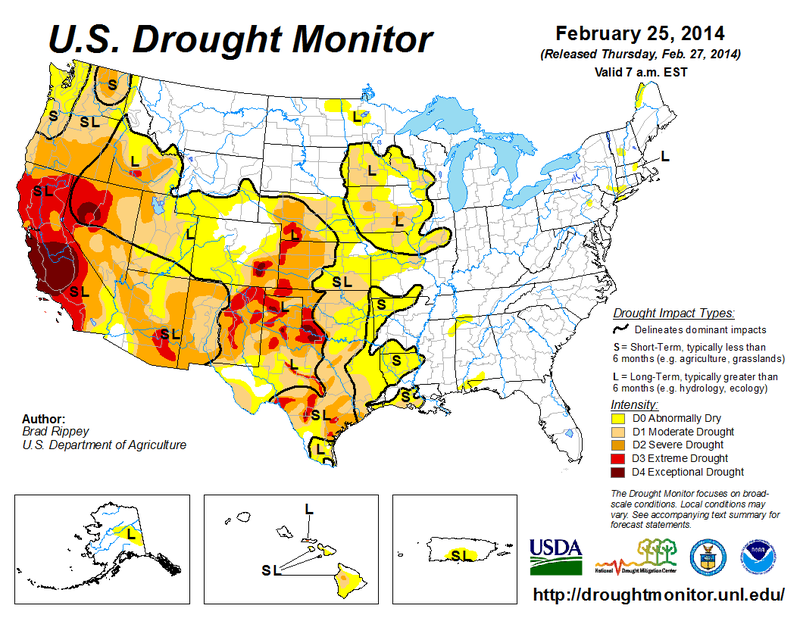 U.S. and global drought is a major concern, especially as we enter the Northern Hemisphere growing season. "Despite this week's forecast, the weather systems are unlikely to make a significant dent in the state's water deficit. Even if San Francisco gets 2 inches over the coming days - an optimistic projection - the city will still be at 50 percent of average rainfall for this time of year, Benjamin said. "It all goes in the plus column," he said. "But it is still far outweighed by the negative column." The four following images illustrate the current U.S. drought problem. The most severe winter precipitation shortfalls, some over 20 inches, are clustered along the West Coast, reflecting a practically non-existent winter rain/snow season. Yet further significant shortfalls are also apparent in the south central and southeastern U.S.
5.85 inches: The amount of rain the that San Francisco has received since July 2013, only 35 percent of its usual quota for the time of year. 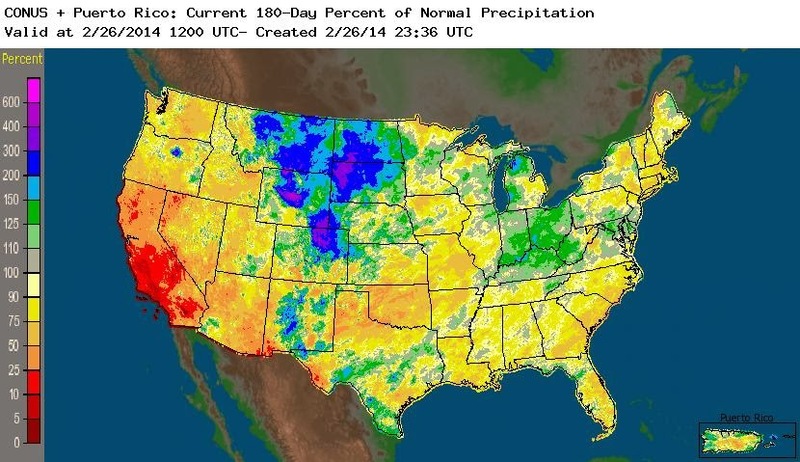 9.52 inches: The rain deficit of the Los Angeles region, which received 0.23 inches so far this month. 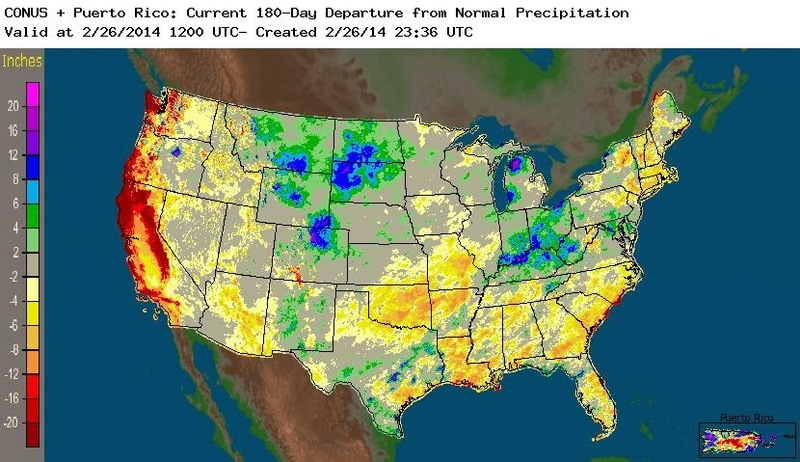 "This recent dry spell accentuates a continuing background condition of prevailing drought across much of the Southwestern US, notes Christopher Williams, a specialist in US drought conditions and an assistant professor at Clark University’s Graduate School of Geography in Worcester, Mass. Precipitation is below 20 percent of normal and signs of the drought impact run across the region, including low river flows, low snow packs, low reservoir levels, and out-of-season wildfires. What this map depicts is the severity of drought across the U.S. with areas such as Texas, Arizona, New Mexico, Colorado, Kansas and Nebraska - some states still in long term drought since 2012. The current soil moisture shortfalls will only be made up by increased snow packs, rainfall in the spring season, or pumping ground water, which is dramatically decreasing aquifer levels in some states. According to NBC News, its been 434 years since a drought this bad hit California. A paleoclimatologist at UC Berkeley who tracks long-term climate patterns by counting tree rings reckons the region hasn’t been this dry since the year 1580. The larger concern is that this is not just a California problem, the entire Southwest is suffering form increasing water restrictions as the Colorado River flow drops and major reservoirs decline. "LAKE MEAD, Nev. — The sinuous Colorado River and its slew of man-made reservoirs from the Rockies to southern Arizona are being sapped by 14 years of drought nearly unrivaled in 1,250 years. "Reclamation officials say there is a 50-50 chance that by 2015, Lake Mead’s water will be rationed to states downstream. That, too, has never happened before. "Unfortunately, the Colorado during most of Lake Mead’s 78-year history was not normal at all. "Studies now show that the 20th century was one of the three wettest of the last 13 centuries in the Colorado basin. On average, the Colorado’s flow over that period was actually 15 percent lower than in the 1900s. And most experts agree that the basin will get even drier: A brace of global-warming studies concludes that rising temperatures will reduce the Colorado’s average flow after 2050 by five to 35 percent, even if rainfall remains the same — and most of those studies predict that rains will diminish. "Lake Mead currently stands about 1,106 feet above sea level, and is expected to drop 20 feet in 2014. A continued decline would introduce a new set of problems: At 1,075 feet, rationing begins; at 1,050 feet, a more drastic rationing regime kicks in, and the uppermost water intake for Las Vegas shuts down. At 1,025 feet, rationing grows more draconian; at 1,000 feet, a second Las Vegas intake runs dry. "“We can’t depend on history to project the future anymore,” Carly Jerla, a geological hydrologist and the reclamation bureau’s Colorado River expert, said in an interview. The drought could end tomorrow, she said — or it could drag on for seven more years." Despite this agricultural situation, neither California nor the US government are allocating water to agriculture this year in California. According to the BBC, California's water agency has announced it may for the first time be unable to deliver water to local agencies, amid a worsening drought and has proclaimed a "zero allocation" for this water year. Two-thirds of state residents and 1m acres (404,500 hectares) of farmland get part or all of their drinking and irrigation supplies from the agency. 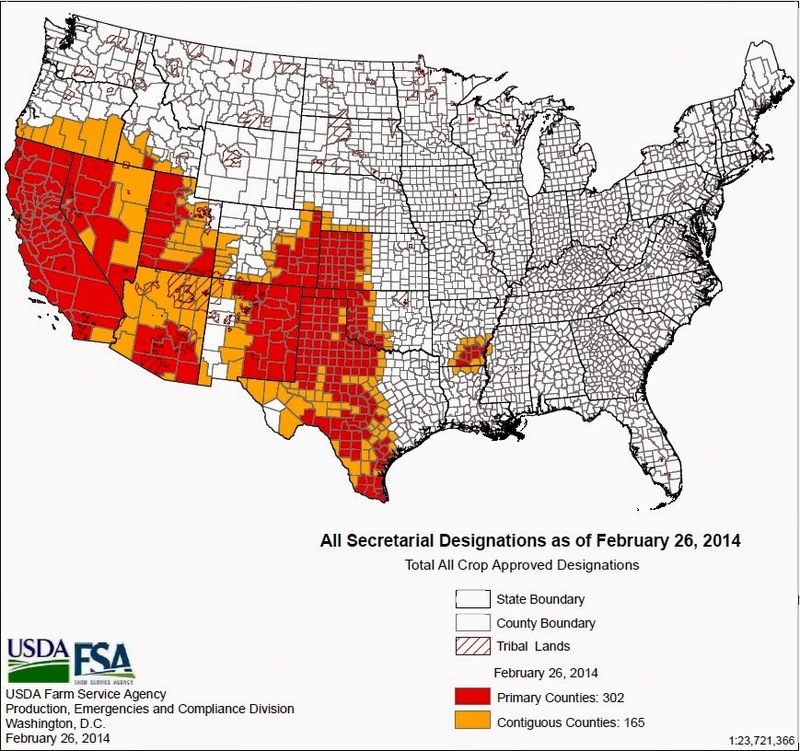 The U.S. Government has also denied water allocation - primarily used for farming irrigation. "Central Valley farmers took a crippling blow Friday, February 21, 2014, when U.S. officials made the unprecedented announcement that they would get no irrigation water from the federal government this year because of the drought. "California's unusually dry weather is forcing producers of fruits, vegetables, nuts and grains to make tough decisions about which crops to plant, and which ones not to plant due to a lack of water, leaving harvests that are likely to fall short of demand. What this sets the stage for is a record fire season. "All the pieces are in place for a really bad season of wildfires," said Malcolm North, a research ecologist with the U.S. Forest Service. 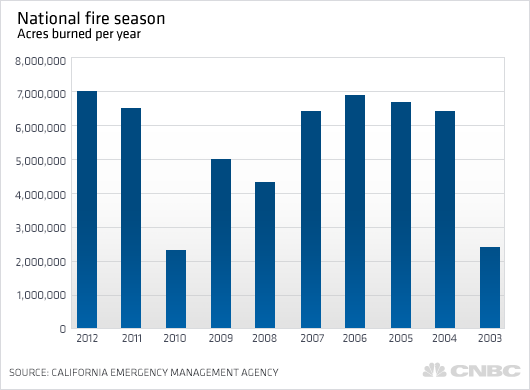 "We're likely to set a record for fires this year." It could be part of a very long fire season, perhaps one that lasts year round. As the farmland dries we may have a decrease in methane emissions, but the resulting tree deaths, drought and fires will likely increase CO2 and CH4 release this year in the US. More on the global drought situation in the next posting and global CO2 and methane emissions.